Ready-made panels e.g. for IO test of xLogic/RievTech Mini PLC EXM-12 and for Andon-systems. Development tool with test run feature for creating and editing panels (pages) on a Windows PC. Scroll down for version history and Beta-versions with more features. Always make a backup copy of the panel (page) files (*.led) before changing to a newer version of the development tool. Note: To use panels (pages) edited with version 6.7.8.3088 of HMI Droid Studio, you need version 1.7.8.89 or higher of the HMI Droid (Android) or version 1.3.0 (Beta) or higher of Odrid HMI (iOS). Note: A panel (page) edited with HMI Droid Studio version 6.7.8.3088 can not be opened in HMI Droid Studio version 6.7.7.2073 again. Bug fix for Undo and changing Font for selected Objects. Bug fix for Undo and the Show in input dialog options in the Numeric variable object. Bug fix for Bar indicator with signed format in the Test run mode. Bug fix for Slider with deadzone in the Test run mode. Default Font for new Objects changed from Bold to Normal. Default background color for new panels (pages) changed to Gray94. Note: To use panels (pages) edited with version 6.7.8.3087 of HMI Droid Studio, you need version 1.7.8.89 or higher of the HMI Droid (Android) or version 1.3.0 (Beta) or higher of Odrid HMI (iOS). Note: A panel (page) edited with HMI Droid Studio version 6.7.8.3087 can not be opened in HMI Droid Studio version 6.7.7.2073 again. Range for Slave ID extended from [1,247] to [1,255]. Pausibility check for IP-address/Host name in the communication parameters dialog. Note: To use panels (pages) edited with version 6.7.8.3086 of HMI Droid Studio, you need version 1.7.8.89 or higher of the HMI Droid (Android) or version 1.3.0 (Beta) or higher of Odrid HMI (iOS). Note: A panel (page) edited with HMI Droid Studio version 6.7.8.3086 can not be opened in HMI Droid Studio version 6.7.7.2073 again. Bug fix for Test run mode and Button objects. Note: To use panels (pages) edited with version 6.7.8.3085 of HMI Droid Studio, you need version 1.7.8.89 or higher of the HMI Droid (Android) or version 1.3.0 (Beta) or higher of Odrid HMI (iOS). Note: A panel (page) edited with HMI Droid Studio version 6.7.8.3085 can not be opened in HMI Droid Studio version 6.7.7.2073 again. Bug fix for text color when using the link option in Text objects. Note: To use panels (pages) edited with version 6.7.8.3084 of HMI Droid Studio, you need version 1.7.8.89 or higher of the HMI Droid (Android) or version 1.3.0 (Beta) or higher of Odrid HMI (iOS). Note: A panel (page) edited with HMI Droid Studio version 6.7.8.3084 can not be opened in HMI Droid Studio version 6.7.7.2073 again. Bug fix for animated image Button. Note: To use panels (pages) edited with version 6.7.8.3083 of HMI Droid Studio, you need version 1.7.8.89 or higher of the HMI Droid (Android) or version 1.3.0 (Beta) or higher of Odrid HMI (iOS). Note: A panel (page) edited with HMI Droid Studio version 6.7.8.3083 can not be opened in HMI Droid Studio version 6.7.7.2073 again. Bug fix for crash problem in Beta versions 6.7.8.3079, 6.7.8.3080 and 6.7.8.3081. Note: To use panels (pages) edited with version 6.7.8.3082 of HMI Droid Studio, you need version 1.7.8.89 or higher of the HMI Droid (Android) or version 1.3.0 (Beta) or higher of Odrid HMI (iOS). Note: A panel (page) edited with HMI Droid Studio version 6.7.8.3082 can not be opened in HMI Droid Studio version 6.7.7.2073 again. The Write byte Button action is supported in the Test run mode. 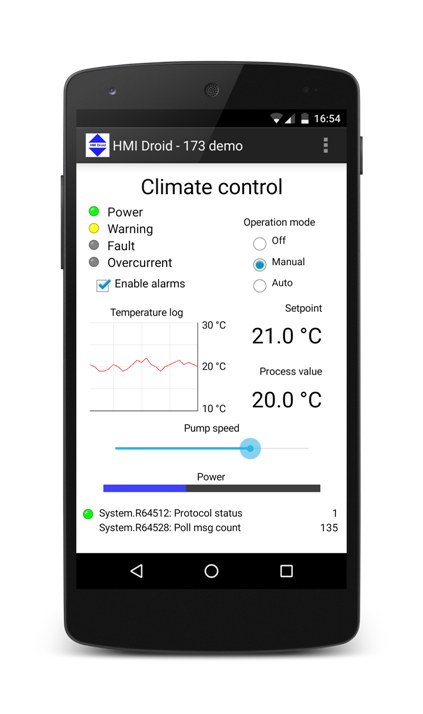 Note: To use panels (pages) edited with version 6.7.8.3081 of HMI Droid Studio, you need version 1.7.8.89 or higher of the HMI Droid (Android) or version 1.3.0 (Beta) or higher of Odrid HMI (iOS). Note: A panel (page) edited with HMI Droid Studio version 6.7.8.3081 can not be opened in HMI Droid Studio version 6.7.7.2073 again. Bug fix for setting the channel property to 0 when copying objects. Note: To use panels (pages) edited with version 6.7.8.3080 of HMI Droid Studio, you need version 1.7.8.89 or higher of the HMI Droid (Android) or version 1.3.0 (Beta) or higher of Odrid HMI (iOS). Note: A panel (page) edited with HMI Droid Studio version 6.7.8.3080 can not be opened in HMI Droid Studio version 6.7.7.2073 again. The Objects variable area can be used for animating image buttons. Note: To use panels (pages) edited with version 6.7.8.3079 of HMI Droid Studio, you need version 1.7.8.89 or higher of the HMI Droid (Android) or version 1.3.0 (Beta) or higher of Odrid HMI (iOS). Note: A panel (page) edited with HMI Droid Studio version 6.7.8.3079 can not be opened in HMI Droid Studio version 6.7.7.2073 again. Up to eight channels can be used for simultanoues connection to multiple PLC (or other devices) in the same panel (page). Note: To use panels (pages) edited with version 6.7.8.3078 of HMI Droid Studio, you need version 1.7.8.89 or higher of the HMI Droid (Android) or version 1.3.0 (Beta) or higher of Odrid HMI (iOS). Note: A panel (page) edited with HMI Droid Studio version 6.7.8.3078 can not be opened in HMI Droid Studio version 6.7.7.2073 again. Up to eight four channels can be used for simultanoues connection to multiple PLC (or other devices) in the same panel (page). Note: To use panels (pages) edited with version 6.7.8.3076 of HMI Droid Studio, you need version 1.7.8.89 (Beta) or higher of the HMI Droid (Android) or version 1.3.0 (Beta) or higher of Odrid HMI (iOS). Note: A panel (page) edited with HMI Droid Studio version 6.7.8.3076 can not be opened in HMI Droid Studio version 6.7.7.2073 again. New command Position in the Format-menu for changing position and size for selected GUI objects numerically. Bug fix for reading boolean variables from the AI (Analog Inputs) variable area, mapped to Modbus Input Registers, in the Test run mode. To use panels (pages) edited with version 6.7.7.2073 of HMI Droid Studio, you need version 1.7.7.85 or higher of the HMI Droid (Android) or version 1.2.29 or higher of Odrid HMI (iOS). Note: A panel (page) edited with HMI Droid Studio version 6.7.7.2073 can not be opened in HMI Droid Studio version 6.7.6.1060 again. Bug fix for the cursor in the test run mode. To use panels (pages) edited with version 6.7.7.2070 of HMI Droid Studio, you need version 1.7.7.85 or higher of the HMI Droid (Android) or version 1.2.29 or higher of Odrid HMI (iOS). Note: A panel (page) edited with HMI Droid Studio version 6.7.7.2070 can not be opened in HMI Droid Studio version 6.7.6.1060 again. Bug fix in the Button object for Test run feature. To use panels (pages) edited with version 6.7.7.2069 of HMI Droid Studio, you need version 1.7.7.85 or higher of the HMI Droid (Android) or version 1.2.29 or higher of Odrid HMI (iOS). Note: A panel (page) edited with HMI Droid Studio version 6.7.7.2069 can not be opened in HMI Droid Studio version 6.7.6.1060 again. Bug fix for writing floats to the variable areas M, I and Q in the Siemens S7 Communication (ISO-on-TCP) protocol driver. To use panels (pages) edited with version 6.7.7.2068 of HMI Droid Studio, you need version 1.7.7.85 or higher of the HMI Droid (Android) or version 1.2.29 or higher of Odrid HMI (iOS). Note: A panel (page) edited with HMI Droid Studio version 6.7.7.2068 can not be opened in HMI Droid Studio version 6.7.6.1060 again. Bug fix (memory leak) in the Siemens S7 Communication (ISO-on-TCP) protocol driver. Bug fix for COM error 0x800736B1 when starting test mode if Microsoft Visual C++ 2008 Redistributable Package is not installed. To use panels (pages) edited with version 6.7.7.2067 of HMI Droid Studio, you need version 1.7.7.85 or higher of the HMI Droid (Android) or version 1.2.29 or higher of Odrid HMI (iOS). Note: A panel (page) edited with HMI Droid Studio version 6.7.7.2067 can not be opened in HMI Droid Studio version 6.7.6.1060 again. Bug fixes in the Siemens S7 Communication (ISO-on-TCP) protocol driver for reading 32 bit variables. To use panels (pages) edited with version 6.7.7.2066 of HMI Droid Studio, you need version 1.7.7.85 or higher of the HMI Droid (Android) or version 1.2.29 or higher of Odrid HMI (iOS). Note: A panel (page) edited with HMI Droid Studio version 6.7.7.2066 can not be opened in HMI Droid Studio version 6.7.6.1060 again. To use panels (pages) edited with version 6.7.7.2065 of HMI Droid Studio, you need version 1.7.7.85 or higher of the HMI Droid (Android) or version 1.2.29 or higher of Odrid HMI (iOS). Note: A panel (page) edited with HMI Droid Studio version 6.7.7.2065 can not be opened in HMI Droid Studio version 6.7.6.1060 again. Range for Siemes S7 Datablock increased from [1,255] to [1,65535]. To use panels (pages) edited with version 6.7.7.2064 of HMI Droid Studio, you need version 1.7.7.85 or higher of the HMI Droid (Android) or version 1.2.29 or higher of Odrid HMI (iOS). Note: A panel (page) edited with HMI Droid Studio version 6.7.7.2064 can not be opened in HMI Droid Studio version 6.7.6.1060 again. Bugfix for using function keys with the Button object. Bugfix for the Line chart object when using the Siemens S7 protocol. To use panels (pages) edited with version 6.7.6.1063 of HMI Droid Studio, you need version 1.7.6.81 or higher of the HMI Droid (Android) or version 1.1.26 or higher of Odrid HMI (iOS). Note: A panel (page) edited with HMI Droid Studio version 6.7.6.1063 can not be opened in HMI Droid Studio version 6.7.5.58 again. New format: Modbus string with reversed (Little-endian) byte order. 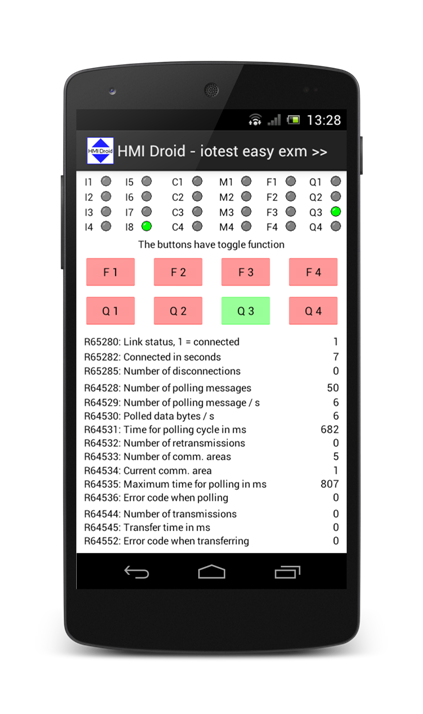 This format is supported in HMI Droid (Android) V1.7.6.82 or higher and Odrid HMI (iOS) V1.1.27 or higher. To use panels (pages) edited with version 6.7.6.1062 of HMI Droid Studio, you need version 1.7.6.81 or higher of the HMI Droid (Android) or version 1.1.26 or higher of Odrid HMI (iOS). Note: A panel (page) edited with HMI Droid Studio version 6.7.6.1062 can not be opened in HMI Droid Studio version 6.7.5.58 again. New formats: Fixed point decimal and Unix time. To use panels (pages) edited with version 6.7.6.1061 of HMI Droid Studio, you need version 1.7.6.81 or higher of the HMI Droid (Android) or version 1.1.27 or higher of Odrid HMI (iOS). Note: A panel (page) edited with HMI Droid Studio version 6.7.6.1061 can not be opened in HMI Droid Studio version 6.7.5.58 again. To use panels (pages) edited with version 6.7.6.1060 of HMI Droid Studio, you need version 1.7.6.80 or higher of the HMI Droid (Android) or version 1.1.26 or higher of Odrid HMI (iOS). Note: A panel (page) edited with HMI Droid Studio version 6.7.6.1060 can not be opened in HMI Droid Studio version 6.7.5.58 again. Improved function when resizing selected objects with regard to "snap to grid". To use panels (pages) edited with version 6.7.5.58 of HMI Droid Studio, you need version 1.7.5.70 or higher of the HMI Droid (Android) or version 1.0.4 or higher of Odrid HMI (iOS). A panel (page) edited with HMI Droid Studio version 6.7.5.58 can not be opened in HMI Droid Studio version 6.7.4.36 again. Bug fix (experimental) for Copy/Paste problem in Windows 10 Version 1709 Build 16229. To use panels (pages) edited with version 6.7.5.56 of HMI Droid Studio, you need version 1.7.5.70 or higher of the HMI Droid (Android) or version 1.0.4 or higher of Odrid HMI (iOS). A panel (page) edited with HMI Droid Studio version 6.7.5.56 can not be opened in HMI Droid Studio version 6.7.4.36 again. English language in object dialogs. To use panels (pages) edited with version 6.7.5.55 of HMI Droid Studio, you need version 1.7.5.70 or higher of the HMI Droid (Android) or version 1.0.4 or higher of Odrid HMI (iOS). A panel (page) edited with HMI Droid Studio version 6.7.5.55 can not be opened in HMI Droid Studio version 6.7.4.36 again. Bug fixes for random beeping sounds in version 6.7.5.52 and 6.7.5.53. To use panels (pages) edited with version 6.7.5.54 of HMI Droid Studio, you need version 1.7.5.70 or higher of the HMI Droid (Android) or version 1.0.4 or higher of Odrid HMI (iOS). A panel (page) edited with HMI Droid Studio version 6.7.5.54 can not be opened in HMI Droid Studio version 6.7.4.36 again. Property dialogs for the Date and Time objects with selectable "Fit width and height" option. Unselect this option to manually control the objects size to prevent truncation of date and text on some target devices. To use panels (pages) edited with version 6.7.5.53 of HMI Droid Studio, you need version 1.7.5.70 or higher of the HMI Droid (Android) or version 1.0.4 or higher of Odrid HMI (iOS). A panel (page) edited with HMI Droid Studio version 6.7.5.53 can not be opened in HMI Droid Studio version 6.7.4.36 again. New command in the Format menu for selecting fonts not available in the PC that HMI Droid Studio is installed on. This can be used for selecting fonts with Chinese character sets (e.g. "Heiti SC") on iOS-devices. To use panels (pages) edited with version 6.7.5.52 of HMI Droid Studio, you need version 1.7.5.70 or higher of the HMI Droid (Android) or version 1.0.4 or higher of Odrid HMI (iOS). A panel (page) edited with HMI Droid Studio version 6.7.5.52 can not be opened in HMI Droid Studio version 6.7.4.36 again. Bug fixes for reading and writing 32-bit variables in the Local variable area in the Test panel mode. To use panels (pages) edited with version 6.7.5.51 of HMI Droid Studio, you need version 1.7.5.70 or higher of the HMI Droid (Android) or version 1.0.4 or higher of Odrid HMI (iOS). A panel (page) edited with HMI Droid Studio version 6.7.5.51 can not be opened in HMI Droid Studio version 6.7.4.36 again. Grid color can be selected. The object selection handles uses the same color as the grid. When selected objects are moved using the cursor keys and the Shift key is held down for moving in large steps, the grid settings for x and y are used as increment to preserve the objects alignment with the grid. Improved support for the PHYS format in the Test panel mode. To use panels (pages) edited with version 6.7.5.50 of HMI Droid Studio, you need version 1.7.5.70 or higher of the HMI Droid (Android) or version 1.0.4 or higher of Odrid HMI (iOS). A panel (page) edited with HMI Droid Studio version 6.7.5.50 can not be opened in HMI Droid Studio version 6.7.4.36 again. Bugfixes in the protocol driver for Siemens S7 Communication (ISO-on-TCP). To use panels (pages) edited with version 6.7.5.48 of HMI Droid Studio, you need version 1.7.5.70 or higher of the HMI Droid (Android) or version 1.0.4 or higher of Odrid HMI (iOS). A panel (page) edited with HMI Droid Studio version 6.7.5.48 can not be opened in HMI Droid Studio version 6.7.4.36 again. Adaptations for running HMI Droid Studio on Linux using WINE. To use panels (pages) edited with version 6.7.5.46 of HMI Droid Studio, you need version 1.7.5.70 or higher of the HMI Droid (Android) or version 1.0.4 or higher of Odrid HMI (iOS). A panel (page) edited with HMI Droid Studio version 6.7.5.46 can not be opened in HMI Droid Studio version 6.7.4.36 again. Support for Siemens S7 Communication in the Test panel mode. To use panels (pages) edited with version 6.7.5.45 of HMI Droid Studio, you need version 1.7.5.70 or higher of the HMI Droid (Android) or version 1.0.4 or higher of Odrid HMI (iOS). A panel (page) edited with HMI Droid Studio version 6.7.5.45 can not be opened in HMI Droid Studio version 6.7.4.36 again. 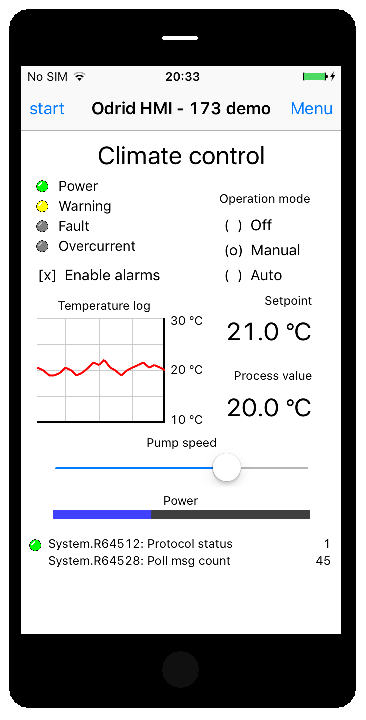 The Modbus Slave Id can be changed in the Test panel mode using objects connected to the system registers. To use panels (pages) edited with version 6.7.5.44 of HMI Droid Studio, you need version 1.7.5.70 or higher of the HMI Droid (Android) or version 1.0.4 or higher of Odrid HMI (iOS). A panel (page) edited with HMI Droid Studio version 6.7.5.44 can not be opened in HMI Droid Studio version 6.7.4.36 again. Bugfix for PHYS-format using the two's complement option in Test panel mode. To use panels (pages) edited with version 6.7.5.43 of HMI Droid Studio, you need version 1.7.5.70 or higher of the HMI Droid (Android) or version 1.0.4 or higher of Odrid HMI (iOS). A panel (page) edited with HMI Droid Studio version 6.7.5.43 can not be opened in HMI Droid Studio version 6.7.4.36 again. To use panels (pages) edited with version 6.7.5.42 of HMI Droid Studio, you need version 1.7.5.70 or higher of the HMI Droid (Android) or version 1.0.4 or higher of Odrid HMI (iOS). A panel (page) edited with HMI Droid Studio version 6.7.5.42 can not be opened in HMI Droid Studio version 6.7.4.36 again. Improved validation of parameters in the dialog for LED objects. To use panels (pages) edited with version 6.7.5.41 of HMI Droid Studio, you need version 1.7.5.70 or higher of the HMI Droid (Android) or version 1.0.4 or higher of Odrid HMI (iOS). A panel (page) edited with HMI Droid Studio version 6.7.5.41 can not be opened in HMI Droid Studio version 6.7.4.36 again. The Date and Time objects are somewhat wider to solve problem with truncated text. Bugfix for the Number and Currency floating point formats. To use panels (pages) edited with version 6.7.5.40 of HMI Droid Studio, you need version 1.7.5.70 or higher of the HMI Droid (Android) or version 1.0.4 or higher of Odrid HMI (iOS). A panel (page) edited with HMI Droid Studio version 6.7.5.40 can not be opened in HMI Droid Studio version 6.7.4.36 again. Bugfix in the plausibility check for the Modbus Slave Id. Variables in the local variable area can be manipulated as bits. To use panels (pages) edited with version 6.7.5.39 of HMI Droid Studio, you need version 1.7.5.70 or higher of the HMI Droid (Android) or version 1.0.4 or higher of Odrid HMI (iOS). A panel (page) edited with HMI Droid Studio version 6.7.5.39 can not be opened in HMI Droid Studio version 6.7.4.36 again. Bugfixes for PHYS-format with Max < Min and test panel mode. To use panels (pages) edited with version 6.7.5.38 of HMI Droid Studio, you need version 1.7.5.70 or higher of the HMI Droid (Android) or version 1.0.4 or higher of Odrid HMI (iOS). A panel (page) edited with HMI Droid Studio version 6.7.5.38 can not be opened in HMI Droid Studio version 6.7.4.36 again. New variable area Objects for connecting different objects to each other. The Object id property for the Numeric variabel object can be set. To use panels (pages) edited with version 6.7.5.37 of HMI Droid Studio, you need version 1.7.5.70 or higher of the HMI Droid (Android) or version 1.0.4 or higher of Odrid HMI (iOS). A panel (page) edited with HMI Droid Studio version 6.7.5.37 can not be opened in HMI Droid Studio version 6.7.4.36 again. Bugfix for Test panel mode and Slider Bar using negative variable values. To use panels (pages) edited with version 6.7.4.36 of HMI Droid Studio, you need version 1.7.4.62 or higher of the HMI Droid (Android) or version 1.0.3 or higher of Odrid HMI (iOS). A panel (page) edited with HMI Droid Studio version 6.7.4.36 can not be opened in HMI Droid Studio version 6.7.1.4 again. Bugfix for the format PHYS and Test panel mode. A negative slope for the format PHYS can created be entering a value for Max that is less than the value for Min. To use panels (pages) edited with version 6.7.4.35 of HMI Droid Studio, you need version 1.7.4.62 or higher of the HMI Droid (Android) or version 1.0.3 or higher of Odrid HMI (iOS). A panel (page) edited with HMI Droid Studio version 6.7.4.35 can not be opened in HMI Droid Studio version 6.7.1.4 again. Settings for S7 Rack and Slot in the communication parameteres. To use panels (pages) edited with version 6.7.4.34 of HMI Droid Studio, you need version 1.7.4.62 or higher of the HMI Droid (Android) or version 1.0.3 or higher of Odrid HMI (iOS). A panel (page) edited with HMI Droid Studio version 6.7.4.34 can not be opened in HMI Droid Studio version 6.7.1.4 again. 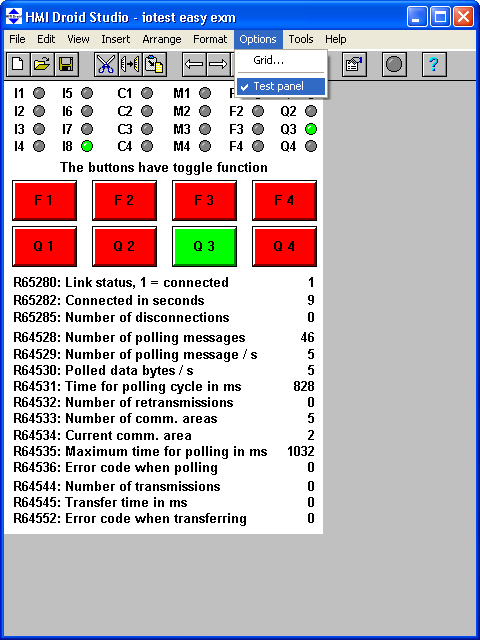 The Test Panel function can use 64,512 (20,000) Holding registers and 65,535 (20,000) Input registers. New system registers for last sent Modbus FC for polling and transfer. Maximum length for pathname for panel files increased from 128 to 256 characters. Plausibility check of the communication parameters before start of the Test panel mode. Bugfixes. Improvements in the Test Panel function. To use panels (pages) saved with version 6.7.1.4 of HMI Droid Studio you need at least version 1.7.1.55 of HMI Droid. 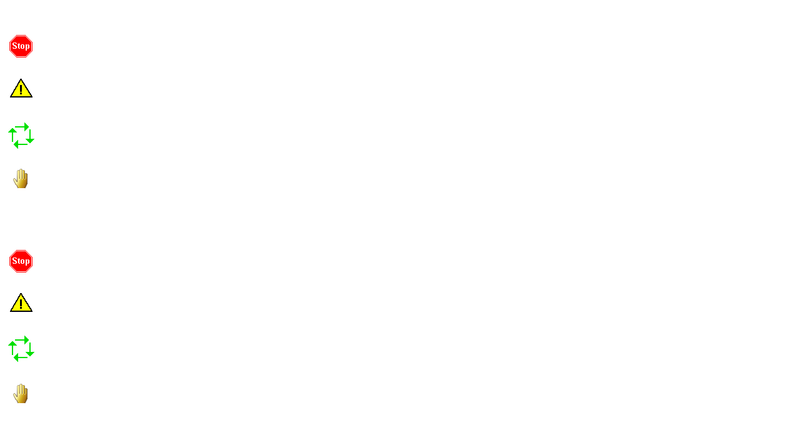 Bugfix for vertical Bar Indicator. Bugfix for Radiobuttons in Test panel mode. The protocol Siemens S7 (ISO_on_TCP) can be chosen in the communication parameters for the panel (page). Validation of the entered data block number in the object's dialogue boxes. LED-objects can be displayed as rectangles and of any size e.g. for Andon-systems. By holding down the shift key while moving the selected objects with the cursor keys, you can move objects in large steps. 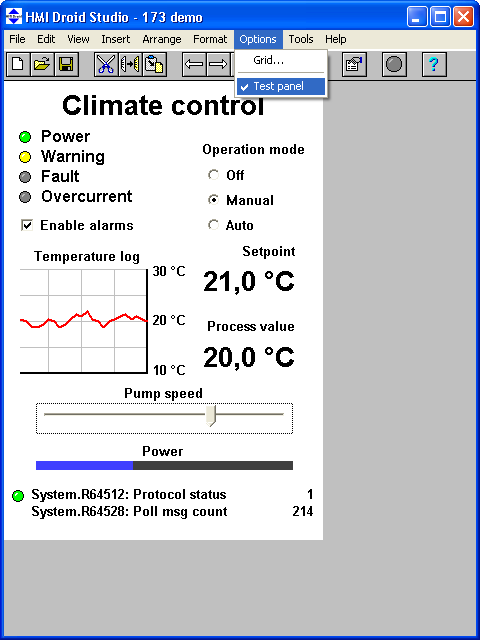 Test panel feature now supports Modbus RTU. New variable area (AI) for analog inputs e.g. for reading Modbus input registers. Test panel feature making it possible to test panels (pages) without first having to transfer them to an Android-device. Test will be closed after 15 minutes. Dialogs for changing/entering numerical or string values are not fully implemented yet but most other featureas are working the same way as on a real Android-device. Word Swap for 32-bit variables in the Modbus protocols can be set per panel. Poll-intervall can be set per panel for saving data traffic and battery. New object radio button for displaying and modifying numerical variables. Ability to select if a background image to be displayed or not. Ability to display variable designations for numeric variables and input fields without opening the dialog. Slider Bar object added to insert menu. New object Slider Bar that can show and change the value for numeric variables in the controller. New data type (format) for variables that can display content in Siemens Step 7 STRING data type when the Siemens Fetch/Write protocol is used. Length of the string must be specified and shall comply with the maximum length of the string in the controller. The panel displays the status of the first digital inputs and outputs, as well as diagnostics for communication. IP-address and port number must be set on your Android or iOS-device or entered in the communication settings for the panel in HMI Droid Studio. 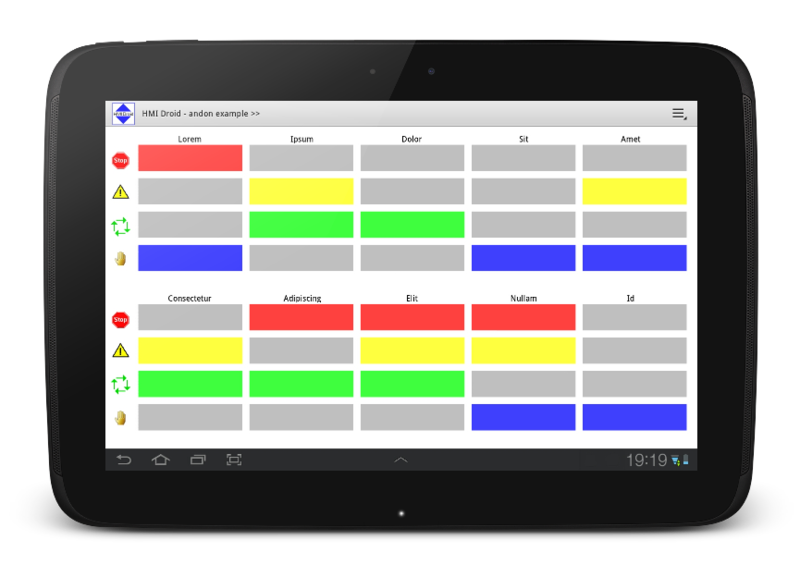 A simple Andon-system for 10 stations. Download panel (page) and background image, modify to fit your needs.